However, in springtime, my personal favorites migrate back north from their winter homes. The beautiful lesser goldfinch begins to visit my feeders. In contrast with my annual birds, they prefer Nyjer thistle. Consequently. I have to use a feeder specifically designed for this type of food. Alas, birds are not the only ones who enjoy sunflower seed. Squirrels are wily pests who also enjoy these tasty treats. I have spent a lot of time and money trying to outwit these pesky rodents. The feeder shown in this picture is called a “squirrel buster plus“. Amazon sells this for $94.99. 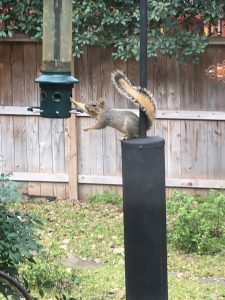 The squirrel is standing on a “squirrel baffle”, part of an advanced poll system sold by Wild Birds Unlimited. He outsmarted me by jumping on top of the pole from an adjacent tree. I haven’t seen him since moving the baffle down and spraying the pole with a generous amount of WD-40. Nevertheless, this entertaining experience reminded me of this song from Mary Poppins. Enjoy. 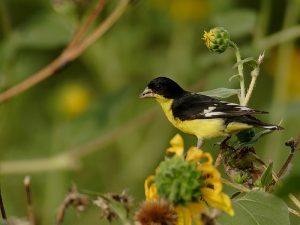 Brad, I love those Yellow Finches too, and they keep me busy! I use the white socks which they love. You can buy large bags so I refill them, and these little guys go through 2 socks in 2-3 days! Another thing that draws these little birds is a running water fountain. Enjoy your feathered friends! Saw a red cardinal taking a bath in a pot saucer on my patio this morning! Love watching the birds, especially those little acrobatic finches! Enjoyed the song I had not heard in a long time AND the squirrel tip which I greatly needed.